TunnelBear is a simple ad minimalist VPN from Canada,with very funny bear puns and animations that’ll make your online activity not only protected and private,but more BEARabale than ever. The Bear wants none of your logs(some honey,though..) so he doesn’t keep them. They provide a OpenVPN connection with 128bit encryption and L2TP/IPSec. ;we’ve said that it doesn’t really matter if it’s 128bit or 256bit in matters of hacking, only with speed. The encryption is done with the CBC BLowfish algorithm. The VPN provider helps you conceal your identity online by using its own ip address, a dynamic ip type. This means the location and host-name change from time to time, letting the user enjoy content otherwise blocked in certain countries. They also have a their own form of currency(we’ll get to that soon) which provides even more identity protection. Unfortunately no P2P is allowed. These guys seems to love its bear puns so much, that the pricing packages remind of the `The Story of the Three Bears`,having larger discounts foe the longer you sign up. With the `Little Bear` option, which is completely free but with a data capacity of 500mb and usage in certain countries not possible. `Giant Bear` will charge with 4.99$ per month but with it you can finally catch that one show on Netflix, while the `Grizzly Bear` offers unlimited data usage for a monthly fee of 9.89$.Plus ,if you’re on the free version, if you tweet about them, you get extra 1GB download limit. The bear doesn’t accept only money,but also jars of honey;which is TunnelBear’s own cryptocurrency,an even more secure payment method than Bitcoin. Most major credit/debit cards and Paypal are accepted. There’s no need to say how creative and funny the site is designed,having a very friendly approach for everyday consumers and techies alike. The support bear answers all your questions via live chat and a ticketing system, but at times he moves a little slow,so we’re hopping for some improvement in that area. The FAQ page,forum,Facebook and Twitter cover most issues with great detail. Sing-up and setup are very easy to do,and some advanced settings are offered,with decent speed on all major OS(Linux,Mac,Windows,Android,iOs) and devices( smartphones,tablet and pc/laptop). 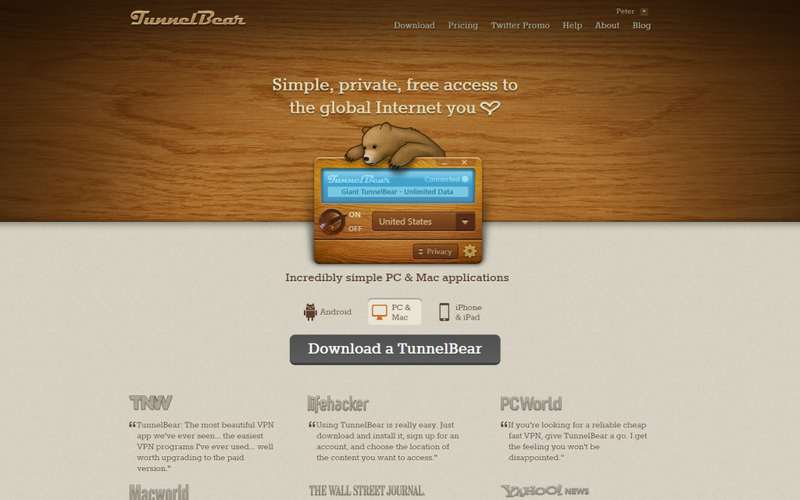 TunnelBear has us in a bear hug with its friendliness and simple to use client,although having very few advanced settings,no P2P, and being based in Canada(we’ve mentioned before that their internet surveillance legislation) but all in all it’s very easy to use and it does job with the fierceness of a grizzly.